The most recent challenge on the 'Daily Paintworks' website was to paint a portrait in blues and purples. 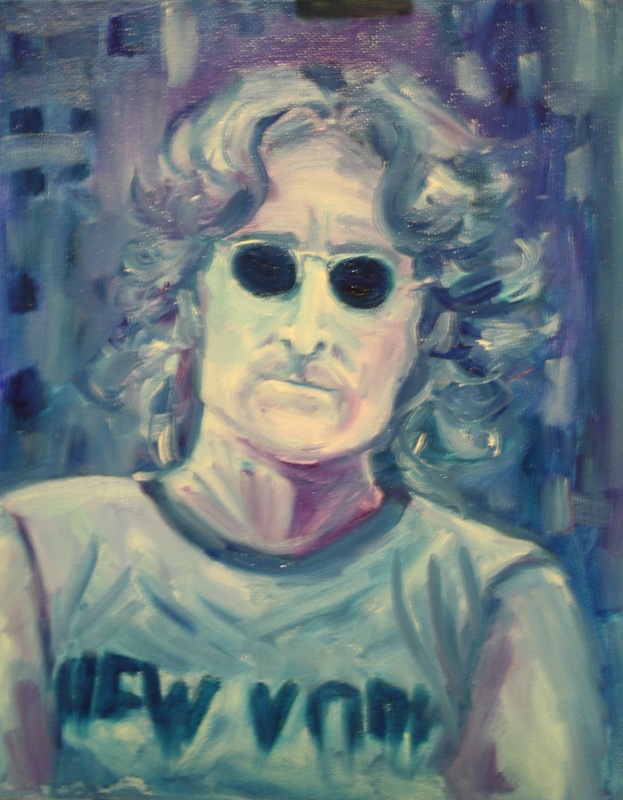 It was supposed to be of my favorite actor, but when I pondered on who I wanted to paint in this moody color scheme, I came upon John Lennon. I painted this based on the famous photograph by Bob Gruen of John Lennon, taken in 1974 for the walls and bridges album. I've read a lot about Lennon and his life. He was often a stormy and emotional individual, and I think that is why I chose him for my painting of blues and purples. Often the stormiest, most dramatic lives are the most influential and artful. John Lennon left a large array of beautiful, inspiring music and a legacy of peace. And yet, when I think of him I often think of mood swings and rebellious attitude. It seems like quite the contradiction, and indeed the best people are made up of contradictions. Think about it. Have you ever said to someone: "I love it, but I hate it too!" That scary movie with the disgustingly gorey zombies that gross you out? That extra piece of chocolate cake that you know will make you feel sick? Those cigarettes that you can't help craving but don't want to smoke? The best things are contradictory. Most people don't like to think about contradictions, because it's not simple and easy. It's not nice to think about the fact that John Lennon sang of peace but had a dark side as well. And yet some people would read his biography and call him choice names, but it's never simple. No one is clear cut. I believe he was a human being: an amazing lyricist, and an imaginative, inspiring individual, faults and all. Everyone is full of their blues and purples and I tried to illustrate that in this painting.